Jumping on ambulances as an observer and helping EMTs and paramedics in the chaotic heart of New York City is easier than you think. Andrea Paci, student nurse, and health care provider for the emergency medical service of Misericordie Lido di Camaiore has experienced this role and told us what it was like. For any lover of emergency and sirens, have dreamt at least one time to spend a day as paramedics at Fire Department of New York. Some who grew up as medic, nurse or rescue volunteer with still this dream inside their heart found the way for NYC, but few of them did find a way to enter the American pre-hospital care system which is different from the European standard. An Italian nurse instead carried on following this dream and it came true in 2016. On the occasion of his graduation to become a nurse, Andrea decided to compare American and Italian clinical standards, in order to make a confrontation between an EMT in the US and a pre-hospital operator in Italy. So he decided to fill out the FNDY application form for the observer program. The observer ride experience is very common in the Anglo-Saxon countries and it’s possible providing voluntary with positions similar to EMTs or paramedic with a series of shifts where you can benefit of a lunch and a dinner per shift. This method of integration and acknowledge of different EMS services and different types of shift is useful for a pre-hospital operator because he/she can test a very different reality before asking for a job application. For example, it is possible doing it with ambulance services of little communities, or with HEMS services also in England. How did you manage to get on an American ambulance as observer? To jump on an American ambulance, you should be at least a volunteer nurse, or – better – a critical care nurse (who have more competences of a paramedic). A fundamental requirement is to know English because you cannot find the application inside the website and it is necessary to submit a specific request via email to FDNY and attach documents. The application request must be filled out with your own skills and in the case of Andrea, he reported that he was an advanced pre-hospital operator and BLSD trainer in Italy for Misericordie confederation. Then the application request proceeds with the necessity of sending curriculum in matter of rescue skills and a notification signed by the public endorsement, i.e. a formal letter signed by authorities of your country that certificates that you are irreproachable and the truthfullness of what reported in your CV. After that, the ridealong office of New York will take at least 10 days to decide whether accept or not. When the positive confrimation arrives, then you can start organize arrival dates, where to operate, shifts and so on. Where did you started operating? “I managed to work for EMS Station of Bellevue Hospital Center. It is a very nice center from where three types of services are dispatched: BLSD ambulances (with 2 EMTs onboard and a AED), ALS units (with 2 paramedics onboard, equipped with ECG multiparameter defibrillator, a ventilator and a set of drugs with a minimum range of managemnt, in the end also an asvanced Rescue Medics unit that can be equipped of biocontainment HazMat unit. I was able to see very well how systems are organized. My unit operated in the heart of the City, from Central Park down to Ground Zero and Batery Park. The incredible thing for an European operator is seeing how many devices and tools is there onboard. Each unit disposed of a touch-screen computer and a keyboard. This can be used by both driver and EMT to look at the dispatch and communicate immediatly with the operation center. That screen shows also the position of other units. This is important in case of emergency because the nearest ambulance can move towards the scene according to the seriousness of the patient they are going to treat. I experienced the usefulness of this system when a may-day has been launched by a group of women assaulted by a drug addict, subsequently arrested. The alert system turned out to be very useful in that case”. “We must consider that both EMTs have tablets for registration, this way there always be a device to communicate backups. and this is essential because dispatches are so many! In 12 hours we made 22 dispatches. Many are simple cases, but we also get tourists calls, especially for homeless people that are signaled as unresponsive. Another difference is that in certain cases, or when we dispatch towards certain places of the City, there always are police to support. I also think that the unique number for emergency is absolutely useful. In the US they have 911, but not only: in some areas, after an ambulance dispatch, a Fire Brigade truck is about to come and support. Many times we can see Fire Brigade dispatch with ambulance and police. It is not so rare. In case of a severe clinical case, the teams will share the treatment. In my shifts, I experienced a dispatch with Engine 1 in Manhattan, which is a special truck with 2 EMTs onboard and takes many clinical cases in charge, especially when there are insufficient ambulances to keep emergency situations under control. This is a sort of integration vehicle, and it’s a ‘level up’ service”. Are there volunteers in such a specialized sector? Would you do this experience again? “Definetely! I’m still in touch with professionals I worked with and we are planning a trip next months, but we must consider costs because the accomodation is on apprentices charge. I would like to analyze deeper other aspects and consider other areas where operate. Manhattan i different from Bronx, Queens, Brooklin and Staten Island. In each of these districts there are different points of dispatch for massive emergency that I wish to experience and check out. For instance, MERM1 is a little hospital on an bus board equipped with dedicated devices to administer oxygen to 30 monitored people at the same time. Then there special services: FDNY has QUAD Polaris units with 6×6 wheels and emergency aid kit for great events (like parades, thriatlons, Thanksgiving Day, Columbus Day, New Years Eve and so on). These vehicles are also used as ambulances in winter for some complex situations, keeping the real ambulances waiting far from great events”. Can you cover also night shifts? “Actually no. Night shifts are not available for us but I’ve been lucky that I could “exceed” a little the afternoon shift. I sked then for a night shift and they allowed me to do it, but it’s so chaotic. I managed to witness a rescue in a homeless structure with a medical service and 4 policemen among 200 people without a house. We did intervientions on substance abuse patients in overdose with ALS, BLSD and firefighters, always escorted by Police. I also followed a dispatch for a case of stabbing with more than one police unit to treat the patient and control the area. A complete experience at 360°, isn’t it? “Absolutely! I could experience how interventions are managed and I can say that there is major dynamic in treating a traumatic patient along Hudson river, for example. I took part into an intervention on FDR Way with more than a medical unit and many injured, I also saw how different organizations interact with each other. 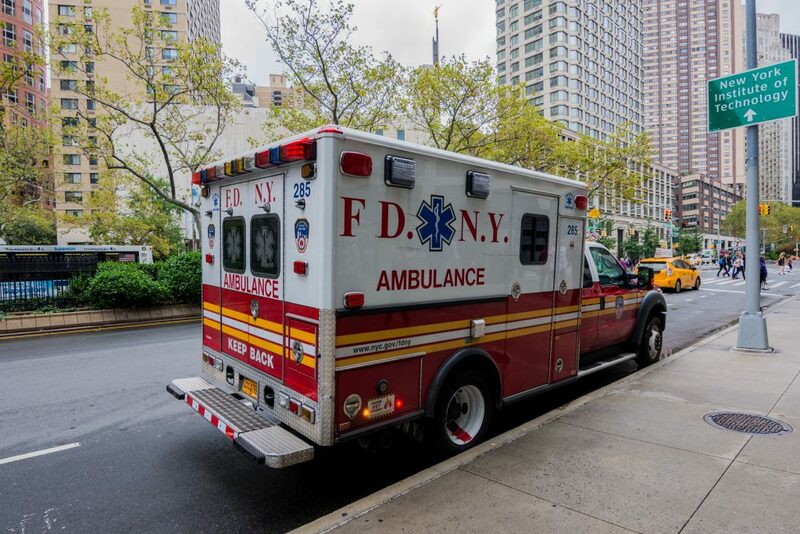 In NYC 80% of ambulance services belong to FDNY and 20% are in agreement (NY University, Senior Care, St Luke, Mount Sinai, and so on). They all have a FDNY partecipating member 911 ambulance patch. Obviously the personal livery remains, but all of those on duty are recognized with a patch to guarantee the agreement”.